Incredible Adventures now offers the opportunity to charter the Derek M Baylis for private “overnight” shark diving adventures. The Baylis can comfortably sleep 8 to 10. For private charter pricing and availability, call 800-644-7382. There is nothing like spending a night at the Farallones! 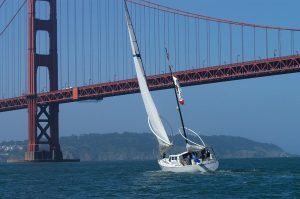 The Derek M Baylis is the same sailboat the author of “The Devil’s Teeth” stayed aboard, during her time at the Farallon Islands.